All the girls in Grand-prix Final look fabulous and were very well dressed! So, it was really difficult to choose who was the best and most stylish. I like the bright color of this dress. It has complex design with open back, asymmetrical bodice with drapery and multilayered skirt. I also like the the dress has the sleeves, they highlight the arms moves. But I think this dress is a bit heavy for this music, that light pink that we see at some summer show was a better choice for this music and program. This season Elena made a huge progress in terms of style of her costumes. I like the simple cut, tiny ruffles on the straps. The decoration of the bodice is also nice and refined. But I’m not so sure about the color of the ribbon. The thing Elena should improve is a quality of the fabric and it’s coloring, because it looks a bit cheap. It’s a nice replica of a movie dress. This dress looks fabulous in movie, it will also look great at gala with all the spotlights. But not every skater can afford to wear white dress for the competition. 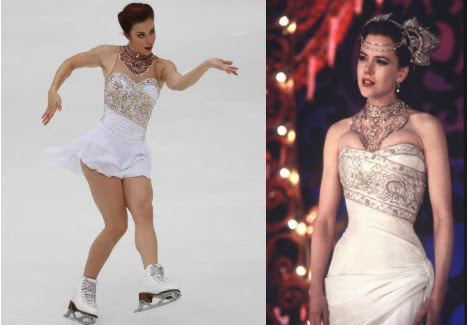 I like Ashley’s dress but think that her previous one was better for this program because it combines two most memorable fashion thing from the movie: the red dress and the necklace. This one is also lovely but not so impressive. Seems that light violet is Mao’s favorite colour because she had lot of dresses of this colour in her career. I really like this adaptation of Japanese national costume. The sleeves is gorgeous and look marvelous in motion adding extra expressiveness to her arms. I also like the execution of the belt. But I would have removed the butterflies because it’s a bit too literal connection of the costume with the music and character. I think Gracie Gold has the potential to become the best dressed skater of her generation. This firebird dress is fantastic and I what I really like about this costume is that it’s not too literal. It bright, with the necessary birds details but still elegant and fashionable. I like the decoration of the bodice with the light feather and tiny translucent parts. And the back of this dress is just marvelous! The dress is really stylish and hot. 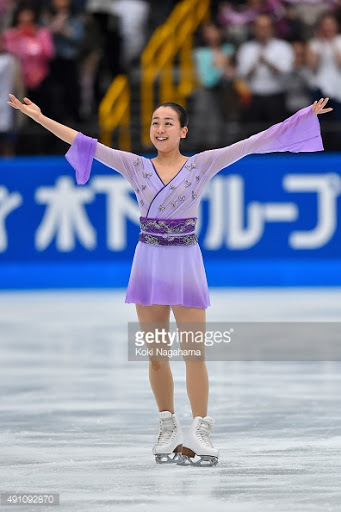 I have already called this dress the best dress from the Skate America 2015. 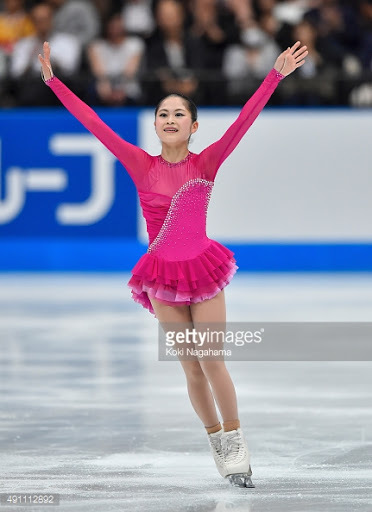 And this time I also think that it was the best dress of the ladies free program. The dress is simple but stunning. Perfect choice of color for this program. Blue with a shade of gray looks not too dramatic but completely reflects the mood of the music. This color in combination with a simple cut not only does not distract from Evgeni’s skating but also highlight her moves and choreo. I even like the gloves! And what I like the most about this dress is that it’s totally suitable for a young girl, that they haven’t made her look older. See the fashion result of the short program at Grand-prix Final: ladies, men, pairs, ice dance. And the fashion results of the junior Grand-prix Final: ladies short and free program, short and free dance.